The Carters/YouTubeBeyoncé and Jay Z in ‘Apesh*t’. 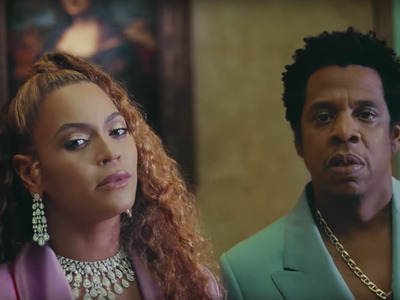 Beyoncé and Jay-Z’s new album “Everything is Love” just dropped on Spotify, Apple, and Amazon. “Everything is Love” was a surprise release on Tidal on Saturday. Tidal’s short exclusive window raises questions about Jay-Z’s plans for the company. Beyoncé and Jay-Z’s new album “Everything is Love” is now available to stream on Spotify Premium and Apple Music, as well as to download on Amazon Music. Beyoncé and Jay-Z dropped the album unannounced on Saturday, June 18. Initially the album, recorded under the name “The Carters,” was only released on Tidal, Jay-Z’s own digital music platform. But it has now been released across three of the world’s biggest streaming services, meaning Tidal had an exclusive window that lasted just hours. It raises questions about Jay-Z’s plans for Tidal, which has been mired in controversy recently after it was accused of wildly inflating streaming numbers for Beyoncé and Kanye West albums. Business Insider has reached out to Spotify, Amazon, and Tidal for comment.